I am a bit excited today. Yeah, it's Friday and whatnot, but this is even better. My funny story about my Comedy of Errors Sweater, aka Napoli Sweater, is featured on Alana Dakos' podcast #68 of Never Not Knitting! I have enjoyed Alana's podcast for a few years now. She started out as a frequent knitter talking about her own projects, knitting product reviews and injecting her own funny knitting stories. Then she started adding funny and interesting stories from her listeners from around the world. In the last few years she has branched out to running her own knitwear design company and has self published, with friend and co-author Hannah Fettig, the very popular Coastal Knits books. Alana has recently self-published a new children's book called "Annie and the Swiss Cheese Scarf"; it is an adorable story about a little girl and her effort to learn to knit. Alana always puts together an entertaining podcast full of knitting stories and now my story, read by me, is being featured on this month's episode! Check it out! Have you ever heard your own voice on tape and been surprised at what you sound like to others? Um, yeah! Kind of surreal. So I have been very busy knitting up some Christmas gifts so I have not been posting much as I don't want to ruin the surprises. My previous hysteria over Christmas knitting has lessened. I am almost feeling Zen about the whole thing now. What will be will be, as such. 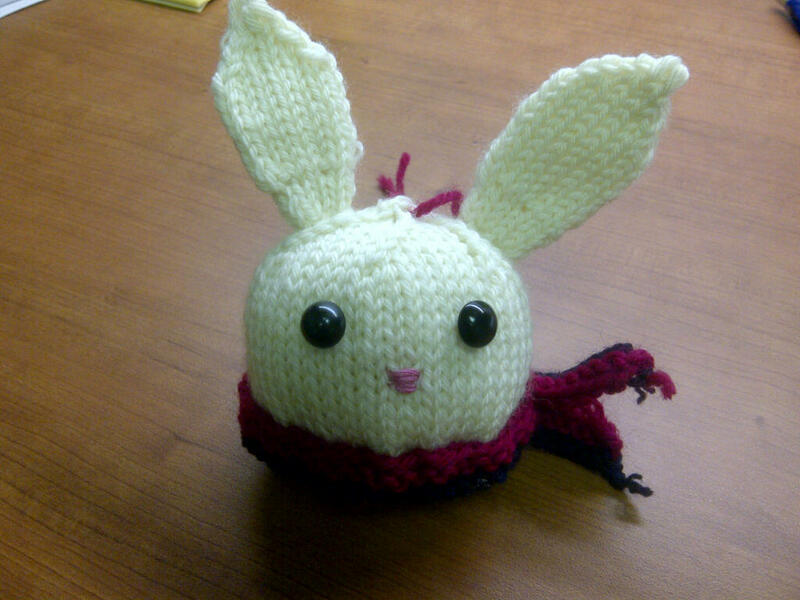 But I can show you one really cute thing that I have knit recently. I'd like to introduce you to: Mr. Bunnyman Blankstare. I had no stuffing at home when it was time to fill this little guy's body and I found myself at a dollar store buying a full sized pillow and cutting it open at home for the filling. I needed a palm full of stuffing and now have enough stuffing for an army of these little guys. Which, if I am not careful, will ruin my new found Zen-like calm and bring me right back to hysterical as I control myself from the idea that I can make 87 more of these before Christmas!